I'm so happy Halloween is on a Sunday this year. Sundays are my one day off. Yesterday was blissful, so restful and blissful. I refuse to do work on Sundays, I even try to stay away from the computer. It's the one day where I get to focus on my family and do some fun cooking projects with them without feeling rushed. In fact our Sunday was pretty great, and we made some wonderful treats and picked a cook off winner (more on that later). On Saturday we went to the pumpkin patch and bought over 30 pumpkins. On Sunday night we hosted a pumpkin decorating party. It was crazy, but I'm still not pumpkined out. 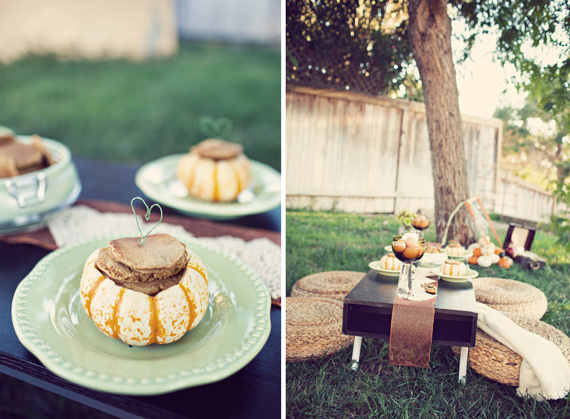 In fact this pumpkin brunch that I recently spotted on Design*Sponge has inspired me to make even more pumpkin things. I never thought of making pumpkin pancakes before but now I will. Pumpkin and maple syrup sounds like a great combo with bacon of course. We're pretty excited for Halloween. Baby Maria finally has a costume, she will be a wild chicken. Enzo puts on his pirate costume multiple times a day. I know he's ready. He's been ready. He was born ready for Halloween. In the morning we're going to a kid friendly Halloween brunch with our friends. I think it will be a riot. Not sure how we're going to keep food from falling on their costumes. I guess stains will just add to the scare factor of the day. What are your meal plans for Halloween? ps. Hope you had a great weekend too. beautiful spread! I love it! And a pumpkin decorating party?? FUN! I wish you were *my neighbor!!! I haven't made pancakes yet, but a delicious souffle, and yes- with maple syrup and bacon... a perfect combination. My meal plan for Halloween... hmm... do reeces cups count as a meal?? dana you're hilarious. Yes, but only if your kids share with you. No stealing allowed. At first, I wasn't sure what to do with my Halloween, but a Sunday Halloween brunch sounds like the most perfect idea! Especially if I got to sit on cute poofs like those.